Automatic video search based on pre-trained semantic concept detectors has recently received significant attention. Since the number of available detectors is much smaller than the size of human vocabulary, one major challenge is to select appropriate (relevant) detectors to response textual user queries. In this project, we propose to exploit the context information associated with Flickr images to estimate query-detector similarity, instead of utilizing WordNet-based ontological measurements as most existing works. Our measurement, named Flickr context similarity (FCS), reflects the co-occurrence statistics of words in image context rather than the textual corpus (e.g., dictionaries or textual documents on the Web). Experiments on the TRECVID datasets using 100+ queries show that the FCS is suitable for measuring the query-detector similarity, producing better performance than several other popular measurements. Recent advances in multimedia research have shown encouraging progress in using a set of intermediate descriptors, namely semantic concept detectors, to bridge the semantic gap between textual user queries and low-level visual features. The detectors are classifiers that automatically index the video contents with generic semantic concepts, such as tree and water-scene. The indexing of these concepts allows users to access a video database by textual queries. In the search process, video clips which are most likely to contain the concepts semantically related to the query words are returned to the users. This video retrieval scenario is commonly referred to as concept-based video search, as displayed in Figure 1. 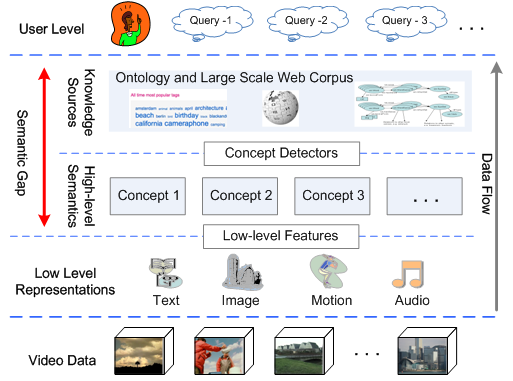 Figure 1: Concept-based video search framework. The semantic concept detectors serve as an intermediate layer to bridge the semantic gap. The proposed Flickr context similarity is used (in the knowledge source layer) to select suitable concept detectors for each textual user query given on-the-fly. However, due to the lack of manually labeled training samples and the limitation of computational resources, the number of available concept detectors to date remains in the scale of hundreds, which is much smaller compared to the size of human vocabulary. Therefore, one open issue underlying this search methodology is the selection of appropriate detectors for the queries, especially when direct matching of words fails. For example, given a query find video shots of something burning with flames visible, explosion_fire and smoke are probably suitable detectors. Different from most existing works in which semantic reasoning techniques based on the WordNet ontology were used for detector selection, here we explore context information associated with Flickr images for better query-detector similarity estimation. This measurement, named Flickr context similarity (FCS), is grounded on the co-occurrence statistics of two words in the context of images (e.g., tags, title, descriptions etc. ), and is therefore able to reflect word co-occurrence in image context rather than textual corpus. This advantage of FCS enables a more appropriate selection of detectors for searching image and video data. For example, two words bridge and stadium have high semantic relatedness in WordNet, since both of them are very close to a common ancestor construction in the WordNet hierarchy. However, when a user issues a query find shots of a bridge, stadium is obviously not a helpful detector since it rarely co-occurs with bridge in images/videos. While for the same query, our proposed FCS is able to suggest a more suitable detector river. where f(x,y) is the number images with context containing both x and y, and N is the total number of images on Flickr (roughly estimated as 3.5 billion at the time we did the experiments). 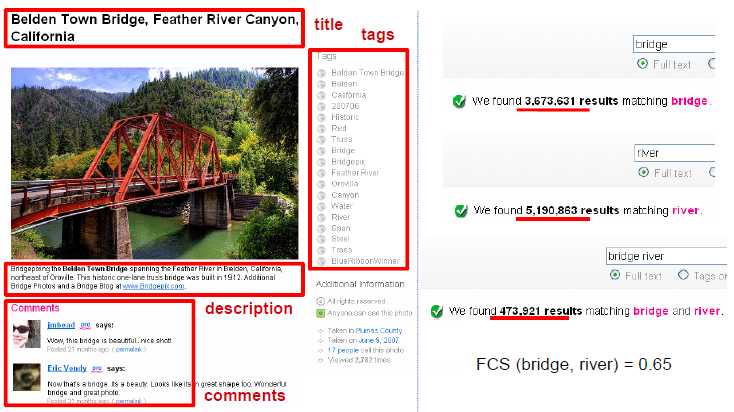 Notice that we search against all kinds of Flickr image contexts (not just the tags, as shown in the Figure below). where ρ is a kernel width parameter. Figure 2: Left. Rich context information associated with a Flickr image. Right. The total number of images returned using keyword-based search in Flickr image context. We evaluate FCS using 100+ queries on the TRECVID video data sets. Table 1 shows the selected detectors for a few example queries, where our FCS is able to select more suitable detectors. For example, FCS selects 'Railroad' for the query term 'train', while WUP and NGD select 'Vehicle' and 'Car' respectively. Obviously 'Railroad' is a better detector for searching 'train' since they frequently co-occur with each other. Figure 3 further compares FCS with other query-detector measurements based on WordNet and Web documents (NGD computed based on results from Yahoo web search API). FCS consistently shows better performance in terms of mean average precision over the queries evaluated in TRECVID 2005-2008. Table 1: Detector selection using various query-detector similarity measurements, including WUP based on WordNet hierarchy, NGD based on textual Web documents (via Yahoo search API), and our FCS based on Flickr context. The detectors are selected according to the query words shown in bold ('goal', 'flames', 'scenes', and 'train' respectively from each of the queries). Figure 3: Search performance comparison using various query-detector similarity measurements. Resnik, JCN, WUP, and Lesk are all based on the WordNet lexicon/hierarchy. Results are shown in terms of mean average precision over the queries used in the official TRECVID evaluations 2005-2008 (TV05-08). Yu-Gang Jiang, Chong-Wah Ngo, Shih-Fu Chang. Last updated: Oct. 30th, 2009.